For many sports and outdoor activities like long-distance running a watch is required with timing related features like a stopwatch, timer. Weather-related features like the temperature, weather forecast are also useful. Also, many people involved in outdoor activities require a compass, to find out whether exactly they are located for moving in the right direction. Usually, most people have to carry a stopwatch, compass, thermometer separately which can be inconvenient. So it is advisable to purchase a NORTH EDGE Watch which includes many features like a compass, altimeter, barometer, in addition to showing the time. The Altay NORTH EDGE digital watch is a unisex watch with a round case of diameter approximately about 50 mm and a display window made from glass. Made from TPR, the band of the watch is 40 mm long. It has a clasp needle type buckle allowing it to be easily fixed and removed. The watch has a digital movement and the time is displayed in the digital format, which allows the user to conveniently read the time and other parameters. 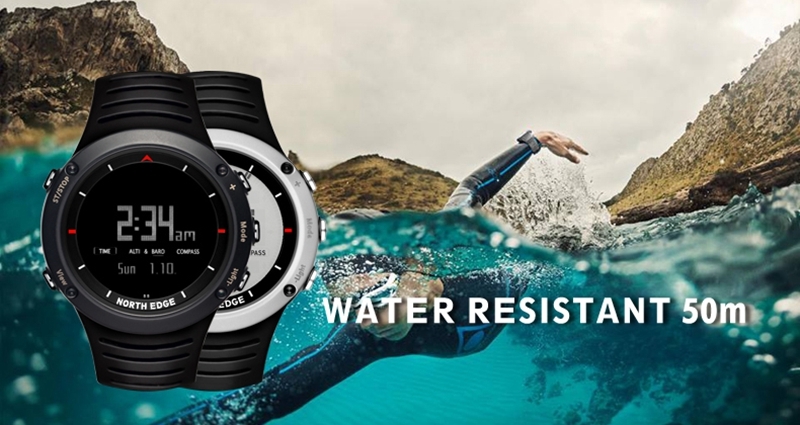 Designed for sports and outdoor use, it is water resistance of underwater 50m so it can be used for swimming. However, it is recommended that the watch should not be used while driving or with hot water. 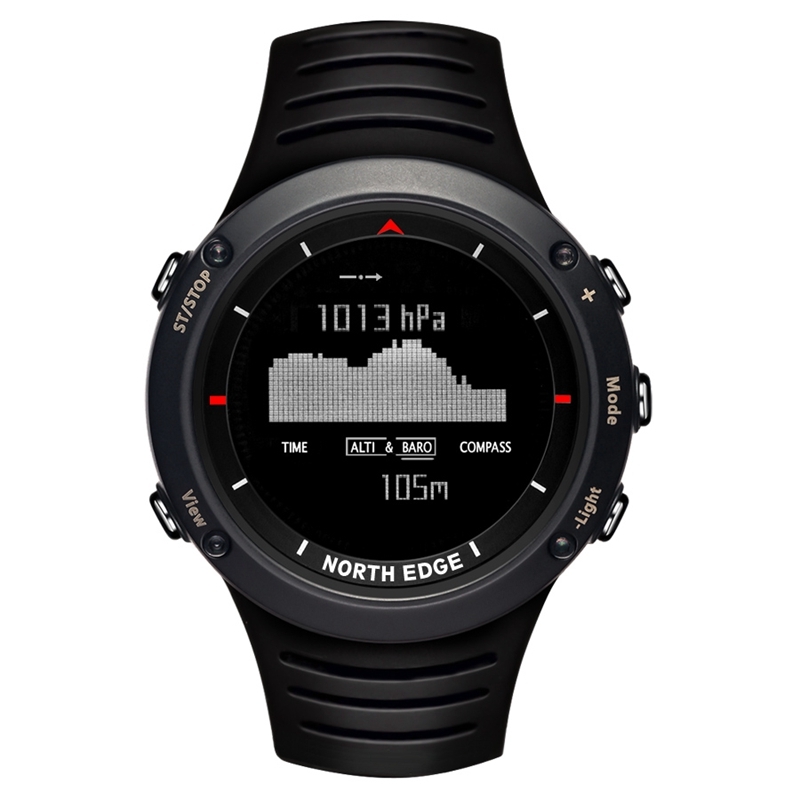 In addition, this digital watch from NORTH EDGE includes an altimeter to indicate the height at a particular location, and a compass to indicate the location. The barometer feature provides details of the trends in air pressure in the last 48 hours and the weather forecast feature is also incorporated. Someone who uses it can also check the temperature with this watch. Besides, the NORTH EDGE Watch that can show the time in the hour, minute, second can be used as an alarm clock, stopwatch for timing a particular event and also as a timer. Coming with an EL backlight, it allows the users to read the time and use the watch conveniently even when there is less light in evening, night or during a power cut. The watch uses a CR2032 battery and a reminder message is flashed when the battery is low. 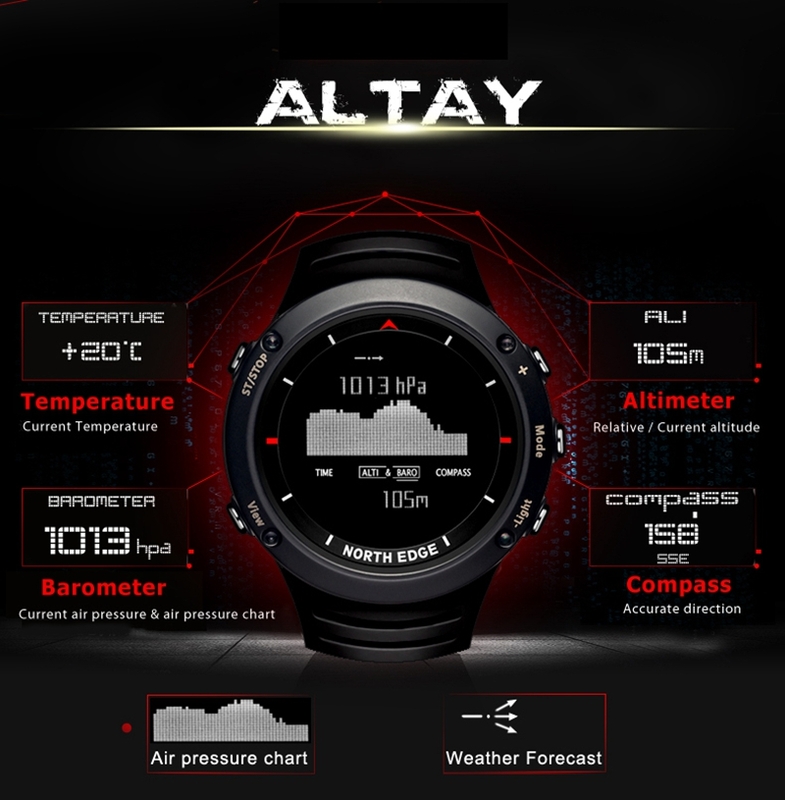 Most of the users who have purchased the Altay watch from North Edge are satisfied with the watch features especially the display and menu options, which allow them to easily check the parameters they are interested in. 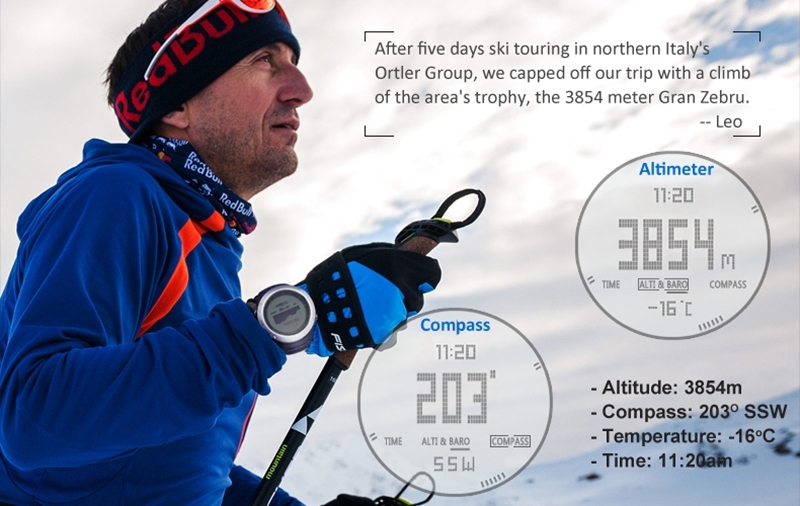 So the Altay model watch is highly recommended for those who are looking for an inexpensive digital sports watch, which combines a large number of features like thermometer and compass.